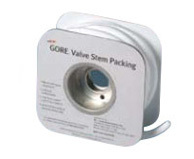 GORE® Valve Stem Packing DP is a pliable, self-lubricating packing that eliminates stem wear and lasts indefinitely. This continuous-length packing installs easily and forms a cohesive cylinder when compressed, thereby eliminating the need to cut and form rings. GORE® Valve Stem Packing DP is unaffected by all common chemicals. It is ideal for use in process lines in chemical processing plants and petroleum refineries. Resistant to all media (pH 0-14), except for molten or dissolved alkali metals, and elemental fluorine, particularly at high temperatures and pressures. Stability: Not subject to aging, UV-resistant and can be stored indefinitely.